When Phonics for Parents showed up in the mail, I was instantly captivated. How much it would have helped me when I was trying to teach my children to read! I relearned phonics alongside them, using the teacher’s guides of our reading program, but that is a very inefficient way to do things. With this little book under my belt I could have taught on the fly, using just the right moments throughout the day. We could have focused more on reading, and I would have been more relaxed and confident. It is so important to know the basics of phonics, especially if you are a beginning reader or if you teach beginning readers. How else can anyone sound out unfamiliar words? How else can we help our children to sound them out? That is where Phonics for Parents comes in. Covering the basics, from vowels (short, long, and in between) to consonants (including blends and digraphs), author Dr. Perry gives helpful hints about what to do and what to avoid when teaching new readers. Anyone who studies this book before teaching reading will have a much easier time, no matter what program their children use. As John Milton Gregory says in The Seven Laws of Teaching, it is important for teachers to know what they are talking about. In other words, homeschooling parents ideally will do some studying themselves in order to use their time well. This little booklet will help. And, yes, there are seasons in a mother’s life when it seems impossible to add anything more. However, studying basics like phonics is an investment in homeschooling that will make life much easier in the long run. It is worth eliminating something else for a brief time to absorb the contents of this short book. Dr. Leslie Ann Perry, retired professor of education, former elementary teacher, and author of many books and articles, understands phonics, children, and education. Phonics for Parents, a gold nugget for all teachers of reading, is the product of years of experience. I highly recommend Phonics for Parents to all homeschooling parents who need to relearn or review phonics. Note: This book is for parents and teachers; it is not a textbook for children, but it will help you teach children to read. 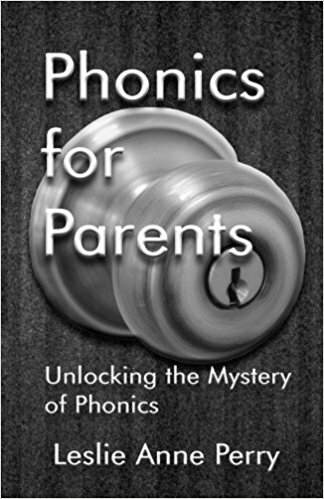 Disclosure: I received a free copy of Phonics for Parents from Leslie Perry when I agreed to review one of her other books. I am not compensated for recommending it and have given you my own honest opinions.